(CNN) - New Mexico Gov. Bill Richardson on Wednesday sharply disputed Bill Clinton's reported claim that Richardson promised not to endorse Barack Obama's bid for the White House. "I never did," Richardson told CNN. "I never saw [President Clinton] five times. I saw him when he watched the Super Bowl with me. We made it very clear to him that he shouldn't expect an endorsement after that meeting." Bill Clinton's comments reportedly came during a recent meeting with some California superdelegates. The San Francisco Chronicle reported the former president got "red faced" when the subject of Richardson came up and said, "Five times to my face (Richardson) said that he would never do that." In the interview Wednesday, Richardson acknowledged he was "very close to endorsing" Clinton, but decided not to after the campaign got "nasty." "I held back. I waited. I felt the campaign got nasty. I heard Senator Obama; he would talk to me continuously," Richardson said. "The Clintons should get over this," he added. Richardson, a former U.N. Ambassador and Energy Secretary in the Clinton administration, endorsed Obama late last month. 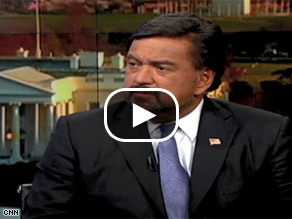 Related: Watch Bill Richardson's interview on The Situation Room. O'Bama and Richardson deserve each other. They are both toast. McCain will sweep the country if Obama is the candidate of the left. The Republic of Texas is coming. There is something in Richardson's tone that leads me to believe he did promise his endorsement to Hillary. I noticed when John King interviewed him, he put his head down and no eye-to-eye contact. He also said, Obama was constantly calling him. I think Richardson got sick of the calls and caved, but no way do I believe he didn't first promise it to Hillary Clinton. Obama brought up Al Gore's name in PA at a rally and said he will give him a position. He went on to say he speaks to Gore often. Name dropper yes, but, he calls Gore trying to capture an endorsement. Glad to hear Mr. Richardson make this statement. It made no sense that Bill Clinton was so angry and redfaced- now it does; Bill Clinton was making the "five times" thing up? It's possible isn't it. What an increasingly ugly presidential race. I for one must reject candidates who lie at the frequency and depth that the Clintons manage. Sore Loosers! GET OVER IT!!!!!! Clinton's, they said his endorsement is almost nothing. Now, everyday they are crying out using Russiand style. Your career is over, Mr. Richardson.